You may remember seeing the fantastic hamper that I was sent from Spicers of Hythe a few weeks ago, a great peek into what you could possibly buy someone for Christmas. Well I have a little treat for you guys. The wonderful people at Spicers of Hythe are kindly allowing me to give away one of their fantastic Joybelles Christmas gift hampers. I for one am eyeing up the mince pies and plum pudding mmmm. Now to have a chance of winning all you need to do is fill in the rafflecopter form below. The giveaway is open to UK residents only and will end on the 23rd of October 2015 at 11.59pm. All entries are checked and verified so make sure to enter correctly! Mince Pies are my favourite so I would try those first. the crisps. i love crisps! Black Forest Crunch sounds particularly scrumptious! The Guylian Chocolate, i haven't had those since i was younger. Take me back to my childhood! Plum pudding, nothing says Christmas quite like it. I've had Christmas pudding, but never plum pudding. I'd love to change that. The Guylian chocolates. I love them. The black forest crunch biscuits sound tasty! oooh the black forest crunch! The Mince Pies, I'm addicted. OMG!! Christmas Pudding Fudge Bag sounds amazing!!!!!! Black Forest Crunch biscuits sound good! let me loose on the Black Forest Crunch! Spicy Moroccan Seed and Nut Crackers. the fudge bag & the chocs! The Guylian chocolates - they're my favourite! Plum Pudding - Best thing about Christmas! I would try the Yorkshire Crisps first - They have such a nice selection of Hampers I like the look of the Sleigh Bells one! Black Forest Crunch sounds good, yum! The Guylian Chocolate they are families favourite! Mince pies - my favourite!! I love mince pies so I would try those first. I would attack the fudge bag first! It has to be the Mince Pies, Christmas isn't Christmas without them! The plum pudding - it's my favourite Christmas treat. I hope I've pinned the image properly,my daughter ,bless her,keeps trying to teach me how to do these things but oh my goodness has she got her work cut out.I think I get the hang of these things but some things I haven't a clue about,"Klout Me" is one,what on earth is that ?,instagram,well apparently I need a smartphone so that's me out and the latest,"stumbleupon" what !! !.If things keep changing before long all I'll be able to do is comment and share.Anyway,sorry for going on a bit but you did say you like reading comments ! The Seasalt Crisps, thanks for the lovely giveaway. So many great products. I would love the opportunity to try the plum pudding, thank you. The plum pudding - never tried it before. The Black Forest Crunch sounds heavenly. got to be the mince pies! Plum pudding - Love it, love it! The Plum Pudding, never had one that is called a Plum Pudding. The Rhubarb and Custard sweets. I haven't had any for years! Although the Christmas stuff looks richly delicious I have a hankering for the rhubarb and custard as they were a childhood fave. 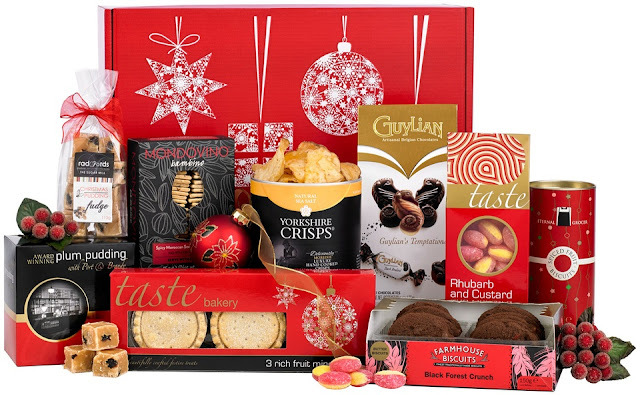 The Black Forest Crunch looks delicious - so does the rest of the hamper though! The 'Yorkshire Crisps' sound amazing!! Black Forest Crunch and Rhubarb & Custard sweets. the black forest crunch sounds so yummy! Guylian choccies are my fave! !! The Mince Pies - they look gorgeous! The Christmas Pudding Fudge Bag would be my first port of call - I have a soft spot for fudge. Black Forest Crunch, I love a good biscuit ! Actually, I'm pretty sure I could easily demolish the lot- it looks divine!